This weekend I finished My Life in France, the memoirs of Julia Child and am truly mesmerized by the woman! Her love for all things French, her appreciation for truly amazing food and most of all, her genuine curiosity to learn everything about the wonderful world of cooking make her the lovable French chef we've all come to know and love. "Learn how to cook-try new recipes, learn from your mistakes, be fearless, and above all have fun!" sounds interesting! i will have to add it to my 'to read' list! :-) did she talk about working for the OSS? 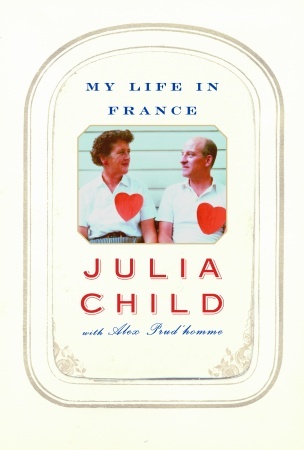 they touched on it briefly in "Julie & Julia"
She talked about it more than it was mentioned in the movie. But it was really interesting how much she shared about her husbands work with the government! I should also mention how inspiring I found her perseverance! Did you realize it took her like eight years before her cokbook was published? And then another eight or so for her second one to be published? Crazy!